This classic Chocolate Toffee Filled Angel Food Cake recipe is so easy to make and beautiful too. It's perfect for a large gathering because it will serve at least 12 people. 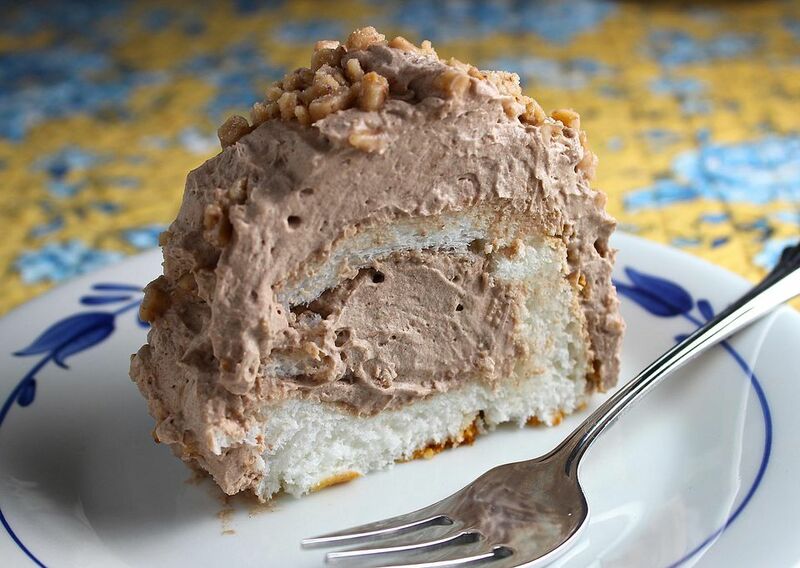 Angel food cakes can be homemade or purchased at any bakery. This is a very simple recipe that beginning cooks can easily make, and it's very impressive too. The only trick is to make sure the cream mixture is beaten well until stiff peaks form when you lift the beater. That means the peaks don't droop but stand up straight. Then, when you fold the cream mixture into the pudding mixture, combine them enough so the two mixtures are combined, but try not to lose much volume. Frosting the angel food cake is very simple too. It's always easier to frost when you have a lot of frosting. That way you don't have to skimp and don't have to worry about getting crumbs in the frosting. Make sure you allow enough time for the whole thing to chill sufficiently in the fridge. Then serve it proudly and bask in the admiration and praise. In large bowl, combine pudding mix (make sure it's instant, not the kind you have to cook) and the cold milk; stir with wire whisk until smooth. Let stand while you whip the cream. In another large bowl, combine the cream, cocoa powder, powdered sugar, and vanilla. Beat on low speed until combined, then beat on high speed until stiff peaks form. Fold the pudding mixture into the whipped cream mixture until thoroughly combined. Then fold in 3/4 cup of the toffee bits. Place the cake on a serving plate or cake stand. Cut off the top 1" of the cake, using a serrated knife. Then cut a 'trench' in the cake, leaving a 3/4" border on the sides and at the bottom. Pull the cake out of the 'trench'. You get to eat the cake pieces! Fill the 'trench' with some of the chocolate cream mixture. Then replace the top of the cake. Frost the cake all over with the remaining chocolate cream mixture. You'll probably have some left over - have yourself a cook's treat and eat the angel food cake pulled from the center with the rest of the chocolate cream! Sprinkle with the remaining toffee bits. Chill the cake in the refrigerator until set, at least 4 to 6 hours. To serve, slice using a serrated knife.